Dahlia was a stray in western Virginia and ended up in a shelter. 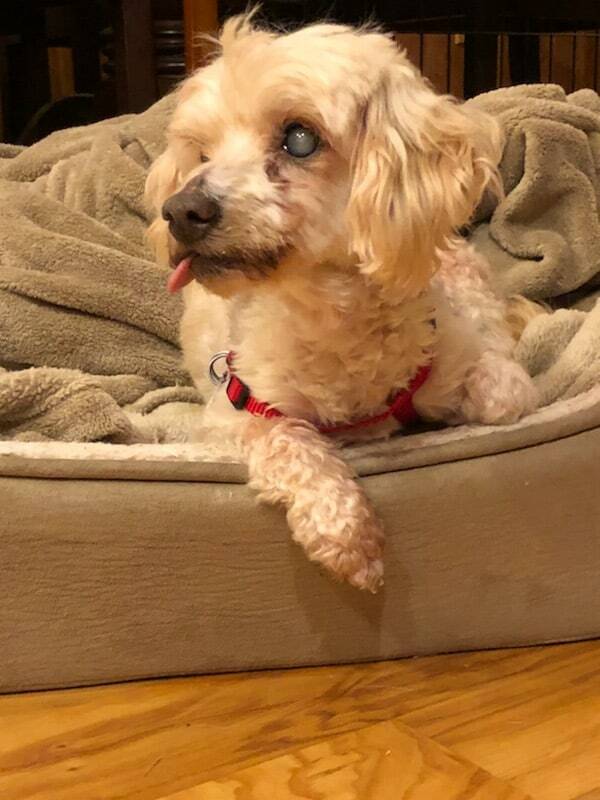 The shelter contacted the Blind Dog Rescue, and Dahlia was brought to her Virginia BDRA foster home in July 2018. Dahlia (Dally) is a 9 pound apricot poodle. Because she was a stray, her age is unknown, so the vet took a guess, and said maybe she is as young as ten, maybe as old as fifteen. Dally has no teeth, and is blind, due to a cataract, in one eye. She has some vision in the other eye, where there is also a cataract. Currently she needs no eye medication. She can hear very very little. She had a bilateral ear infection when she first arrived that lingered for several months but, after a trip to a vet specialist and another month of meds, her ears finally cleared up. She has tested positive for Lyme and was prescribed a month of Doxycycline; she will need to be tested again in February 2019 to make sure she is doing well. 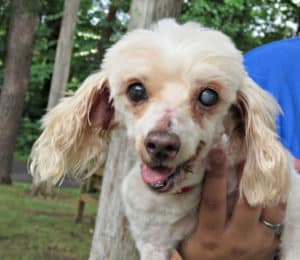 She had numerous lumps and bumps on her body, as old poodles tend to have, and they were very itchy for her; she was chewing and biting them, and they were bleeding, so about 20 of them were removed. After two weeks, none of the incisions were healed, so each site was opened up fully and she was restitched and stapled and also received laser treatments to help her heal. After two more weeks, she is still waiting to get some of the staples out; they should be out by mid-January at the latest. The vets say because she is so old her skin is very slow to heal. She takes half an Apoquel at this time to decrease the itching, and she may need more than that over time. She still has some lumps and bumps on her body (there were too many to remove all of them) and they will need to be watched for changes, and it is likely new lumps will develop over time. She also has a sinus arrhythmia that requires no medication. In addition, she has an oral nasal fistula in her mouth, and it has likely been there for a long time; at some point, it may require surgery. It needs to be watched because it can open wider. Even now, she can get food up into her sinuses through the fistula but giving her a mix of mostly dry kibble with a little wet food stirred in seems to be working fairly well at this time. Sometimes it sounds like Dally is whistling because the air is moving from her mouth through the fistula and out her nose (or maybe it is moving in the reverse direction). Dally is a little weak in her hind end, and so sometimes needs some help staying up when she is doing her business outside. Sometimes she has trouble walking around in the foster home and other times does pretty well. She had an Anti-Mullerian blood test which indicates she has been spayed. The tip of her tail is significantly bent but the vet does not think it causes her pain. Dally arrived at her foster home seemingly unaware of what housetraining was all about. She has improved, although is still not reliable, so she wears a diaper at times in her foster home, especially at night and during the day when her foster parents are at work. Sometimes she drinks a lot of water at once, and may vomit some up once she is through. Her bloodwork has been checked several times, and it is within normal limits so she does not have kidney disease or diabetes at this time. She walks pretty well on a leash, and enjoys being outside. She gets along with the other dogs in the house, and likes attention from her foster parents. She is a very good eater and settles into a crate at night to sleep, sometimes after a short round of barking. She likes to bark in the car. And, if not crated in the car, she can be very active! As with all dogs, Dally needs close supervision if young children are around. With most any rescue dog, the past history is unknown so the future cannot be predicted. What is known is Dahlia is very deserving of lots of love and care, and a wonderful forever home! Dahlia was adopted on January 25, 2019. Dahlia doesn't like cats therefore, a home without a cat or one that will keep them separated at all times is needed. Dahlia is looking for her forever home. If you think it could be yours, read more about Adopting from BDRA before submitting your application below. BDRA relies on your donations to rescue blind dogs around the United States. Please consider giving in support of Dahlia.